Looking for the ultimate blondie recipe? 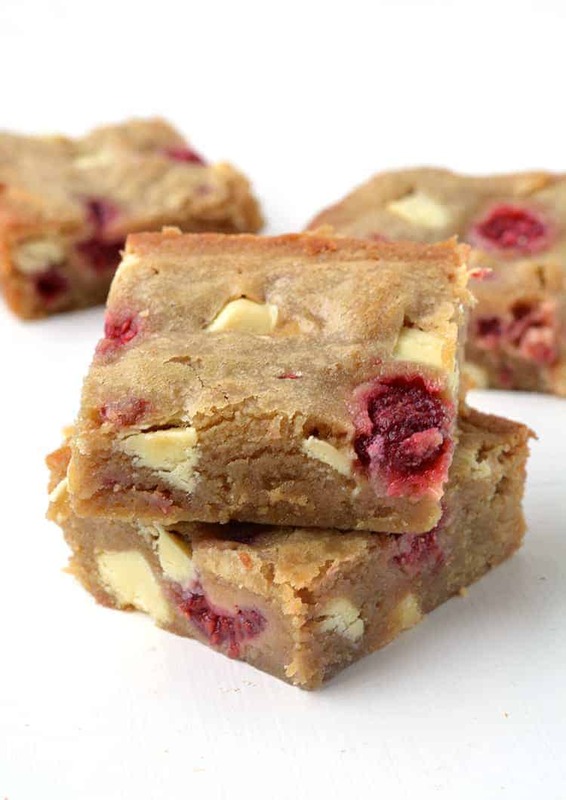 Try these big, buttery White Chocolate and Raspberry Blondies made with brown sugar. They’re perfect as a special treat or for a decadent dessert. 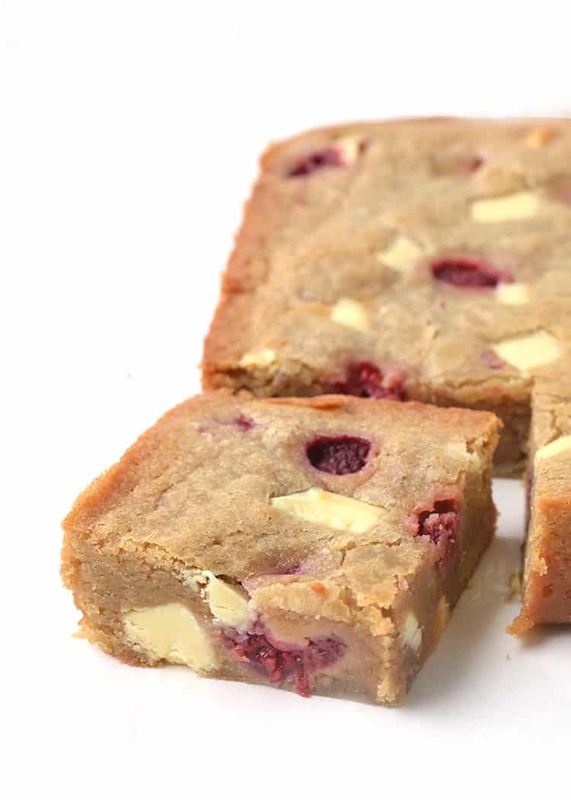 They may be a brownie’s cousin, but trust me when I say, these White Chocolate and Raspberry Blondies hold their ground against the most delicious chocolate brownie. Blondies have always been interesting to me. Most of my life, I wasn’t even sure that I liked blondies. I mean, why have have a blondie, when you can have a brownie? Before I had a blondie like this one. 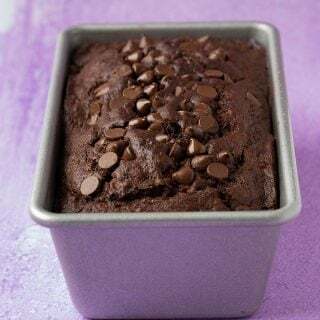 Last year I shared my recipe for Pecan Chocolate Chip Blondies. That was the recipe that first made me realise there was more to this blondie game than I had first thought. 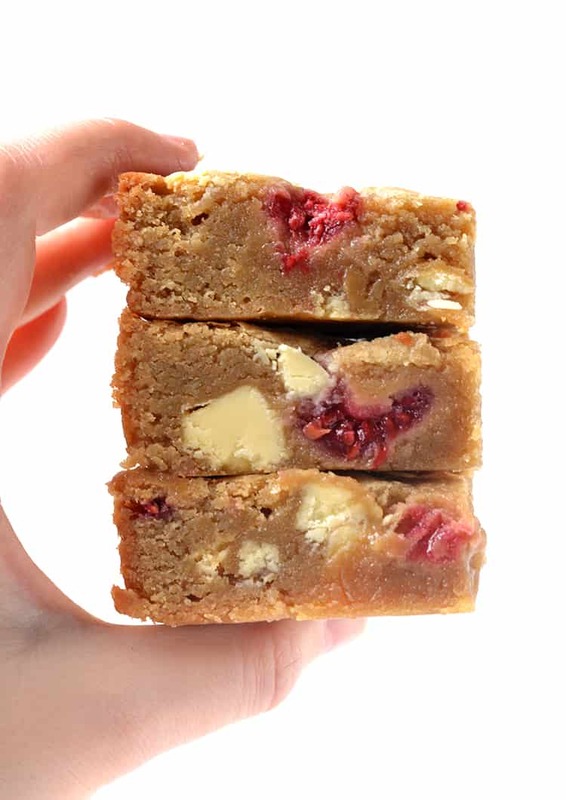 Blondies are different to a brownie. 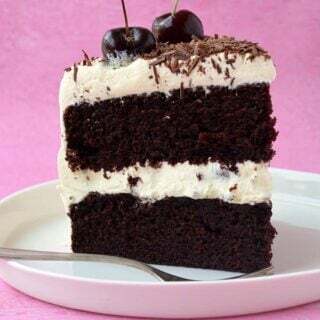 Traditionally, the batter itself isn’t made with chocolate. These are not White Chocolate Brownies. They’re blondies. So the question is, what is a blondie exactly? Well, similar to a brownie, they have a high fat to flour ratio. The butter, brown sugar and vanilla combine to made a creamy caramel-like base. And it’s that batter that just about melts-in-your-mouth. 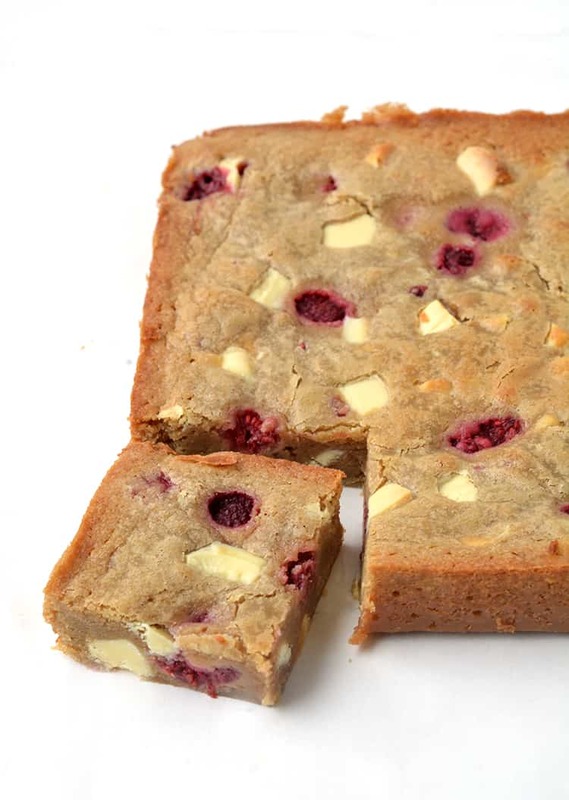 Once you add a generous amount of white chocolate and a handful of frozen raspberries, you have a one heavenly slice. I did experiment with these brownies. I tried creaming the butter and sugar, melting the butter, adding more eggs, reducing the sugar and using more flour. All yielded different results. 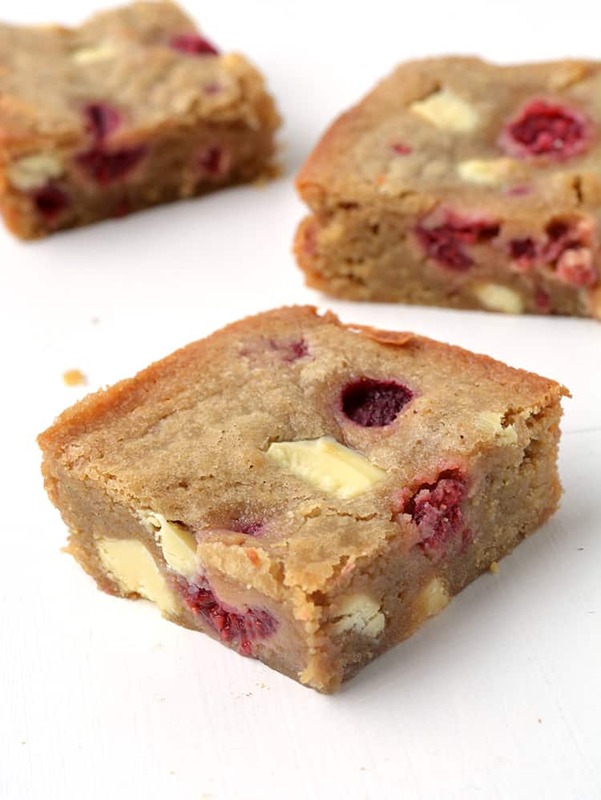 But I can promise that these White Chocolate and Raspberry Blondies are perfect just the way they are. They’re fudgy, sweet but not too sweet and moreish. 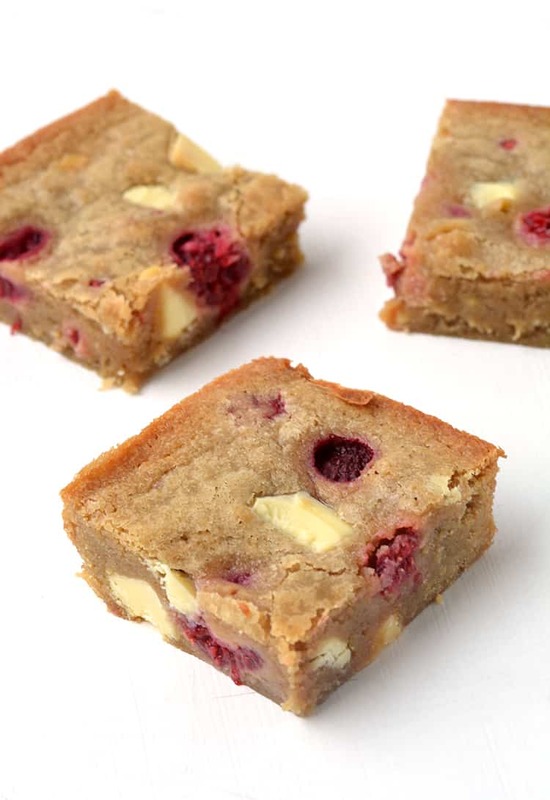 Buttery brown sugar blondies stuffed with white chocolate and raspberries. Preheat the oven to 160 C (320 F). Grease and line an 8 inch square baking tin with baking or parchment paper, ensuring two sides overhang. In a large mixing bowl, add the melted butter and sugar and gently whisk together. Add the vanilla extract and stir. Add the egg and mix until combined. Stir in flour and white chocolate chunks. Fold in the frozen raspberries. Pour the batter in prepared tin, smooth the top and place in the oven. 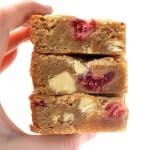 Bake blondies for approximately 30 minutes or until golden on the edges and a skewer inserted in the middle comes out clean. Leave in pan to cool completely. Cut into squares to serve. Preheat fan forced oven to 160C. Grease and line a lamington tin (20cm x 30cm) with baking paper. Melt butter, mix in sugar, add vanilla essence and egg and beat well with wooden spoon. Add four, cocoa and coconut. Stir to combine. Bake in oven 20 minutes or until a skewer inserted in middle comes out clean. Ice with chocolate icing when hot from oven if desired. Allow to cool in tin before removing and slicing. 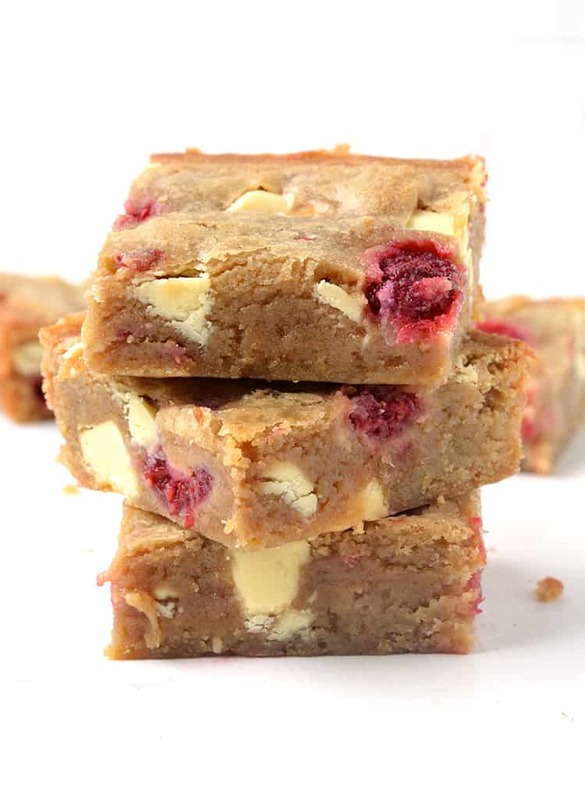 Hi, you can make these without the raspberries or white choc if you like, it’s really up to you! Please can you tell me what size tin you would use if the recipe is doubled? Hi Fiona, my guess would perhaps be a 9×13 inch tin – haven’t tried it myself though! Thank you, I’ll give it a try. Thanks for this recipe – I’ve adapted it slightly and I’ve now baked it three times in a fortnight! That’s it – really straightforward, but effective! I’ve never had so many compliments or requests for another batch of anything! Hi, just wondering, is a fan oven a convection oven? How long do you think these would need to bake in a conventional oven? They look soooo good! Hi Judy, yes it is. I usually use a fan forced oven and it takes about 30 minutes for me. You can use the skewer test to check if they are ready too. I hope you enjoy them! Looking forward to making this recipe! Would it be okay to use all purpose flour? Hi June, yes plain flour and all purpose flour as the same ☺️ Hope you enjoy these! Done these fantastic recipe, though cooking times were way off took mine nearly hour of cooking time in a fan assisted oven. Hi Adam, glad you enjoyed them! Hi Jessica, we’re just getting ready to bake these blondies for Christmas, my question is about the oven, are you using a fan oven? If I were to use one, what temperature and cooking time would be? Many thanks! Hi! I was wondering about the nutritional information, it says 1 serving size = 234 calories. How many servings are there in the whole thing? Hi Angie, good question! You’ll see at the top of the recipe card that it makes 16 slices. Hope that helps! Can I use white chocolate chips instead of white chocolate chunks? Can I use fresh raspberries instead of frozen? Can I use blueberries instead of raspberries? Can the recipe be doubled for a 9″ X 13″ pan (I have a big family)? Hi Richard! Great questions. Yes to the chocolate chips and yes to the fresh raspberries. I haven’t tried with blueberries but I’m sure that’d be lovely too. And yes you can double the recipe but you might have to adjust the cooking time. Enjoy! Thanks. I ended up using a mixture of light brown and light muscavado as I didn’t have enough light brown and they tasted great! Hi! These are in the oven right now but can tell they’re going to be delicious – thanks for the recipe. Just wondered if they are suitable for freezing? Thanks! So glad you enjoyed them Sarah!! I’m going to bake these for my birthday, and i was just curious to know how big your tin was? Hi Dicte, I used an 8 inch square tin. Hope that helps! 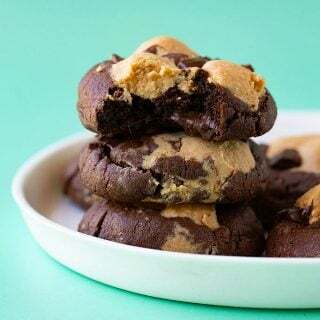 hey made these last week and they were AMAZING!!!!! served them with panna cotta…. MMMMMMM! !